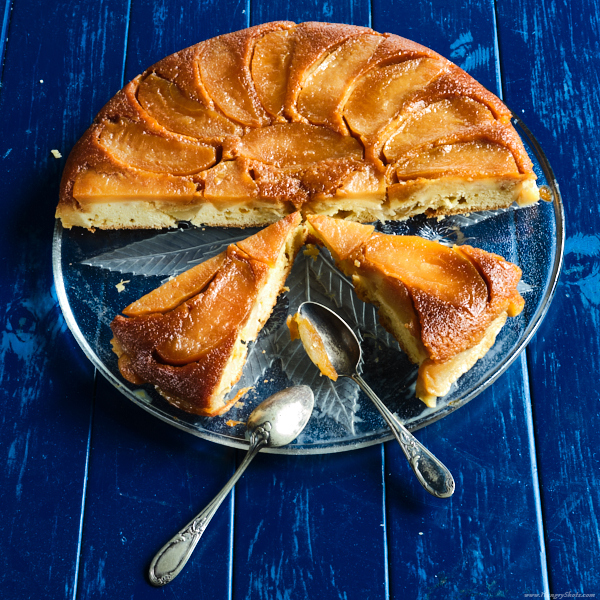 In the last 3 weeks my daughter has repeated me a wish: "I want an apple cake!". The lack of time has delayed my duty to comply with my daughter's wish but I couldn't postpone it anymore so this was the day. I've tried many recipes of apple cakes, that were more fancy and elaborated and this time I wanted the most simplest (and delicious) as possible. As I was also having some guests, the cake should also have been big enough for all of us. I then took the biggest pan I have found, removed the handle so it could fit in the oven and started to prepare it. My daughter was helping me with the mix of ingredients and I was preparing the apples. With four hands, the cake was prepared in almost no time. Then we cooked it, let it cool and reversed it on a big plate. When I first saw it reversed I didn't dare to put the knife in it. It was like a huge sweet flower in the middle of my kitchen table. Clearly the cutting moment had arrived and I was wondering if there would remain at least one piece to make a photo of it. So, I had to sneak and make a photo while it was not yet finished. It arrived that my daughter loved the cake so much that she asked a piece of it every day at school. For me and my husband, we had only enjoyed one small piece as the rest was gone or reserved :). This is that kind of recipe that you might end up doing it over and over again and learn the recipe by heart as it is simple and extremely tasty. Serve it with some whipped cream and it becomes a madness. Beat the eggs and add the 50g of sugar, vanilla sugar, baking powder, melted butter and flour. Put this aside. Take a big pan (preferably non-stick) and add the 150g of sugar. Heat the pan at low temperature until the sugar is melted. Rotate the pan so the caramelized sugar covers the bottom and borders of the pan. Put this pan aside as well. Peel the apples and cut them in big slices. Arrange nicely the slices of apples on the bottom of the pan. Pour the composition over the apples in the pan. Bake in the preheated oven at 200ºC for 45 minutes. Take the cake out of the oven and let it cool for 15-30 minutes. Using a big plate that has at least the same size as the pan, reverse carefully the pan on the plate.